One thing I love is when shopping websites let you put products in a wishlist. Oh my! That becomes an endless list of things I would love to buy, but cannot afford or do not know when to wear! I wanted to share with you a few of my favorite items in my Choies wishlist. Some of them are already on their way to my lovely and very welcoming closet (Yayyy!)... and others will soon (nº1 and nº7)! The last three would be perfect for my trip to Buenos Aires. Yep, I will be there in just a few weeks! Do you also love putting items in your wishlist? love all the things you picked :) and get well soon to you!! Yes indeed, dreaming of clothes that´s such a great hobby ;) The pink blazer is pretty. Loving 1, 7, 9 and 11 :D Really great wish list! We love the first bag!! tolle collage - vor allem den zweiten look finde ich toll! Good for you for wish listing instead of going above what you can spend! 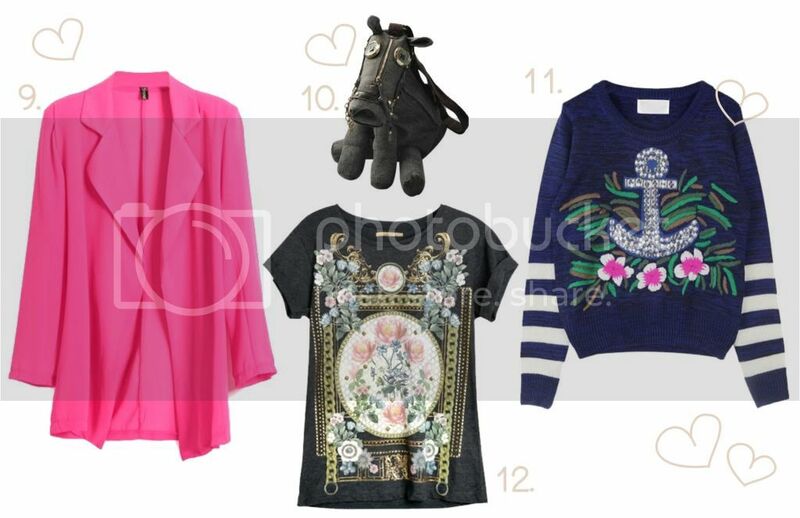 :) I really love that baroque tee; it's so unique and would look really pretty with skinny jeans and a pastel sweater. Nice looking shirt great picks. Love the Neon Blazer .. I lik ethe second bag and the navy srtyle sweatshirt! I loveeee the skirt so much!! Get it Ileana! it's too cute to let go!! Umm why haven't I got that unicorn bag in my hands yet?! nice collection! I love the jacket. Yay for seeing you at Grab a friend , I am following you as well. Oh so great pieces - wanna own them all! love the hot pink blazer!! great eye. These finds are adorable! I love the unicorn clutch, the mini, and the baroque tee. Wow -- so many great pieces! I love No. 4 especially! Awesome Wishlist! I love #2 and #6! 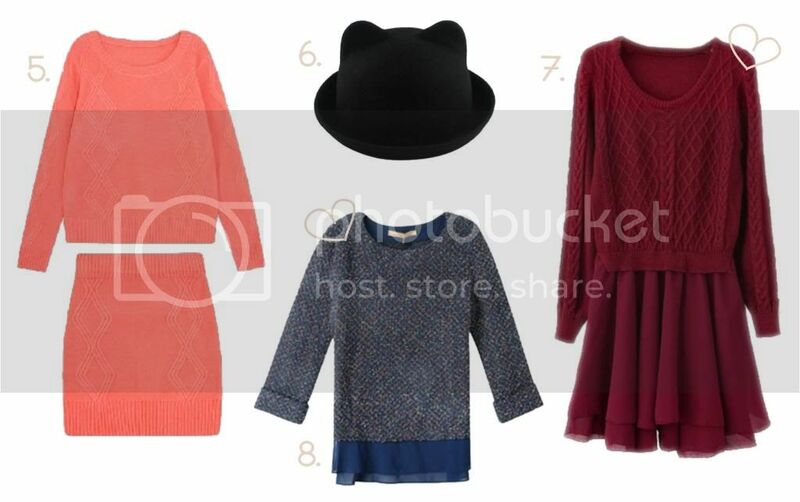 (2) Unicorn handbag and (6) Hat with cat ear are so cute! I'd buy them in a heartbeat! I love those pieces! the pink blazer is awesome! I love love love the burgundy knit dress! My favourite is 11 and 12! so unique but cute!